How to draft an effective Authorization Letter to Claim Salary? 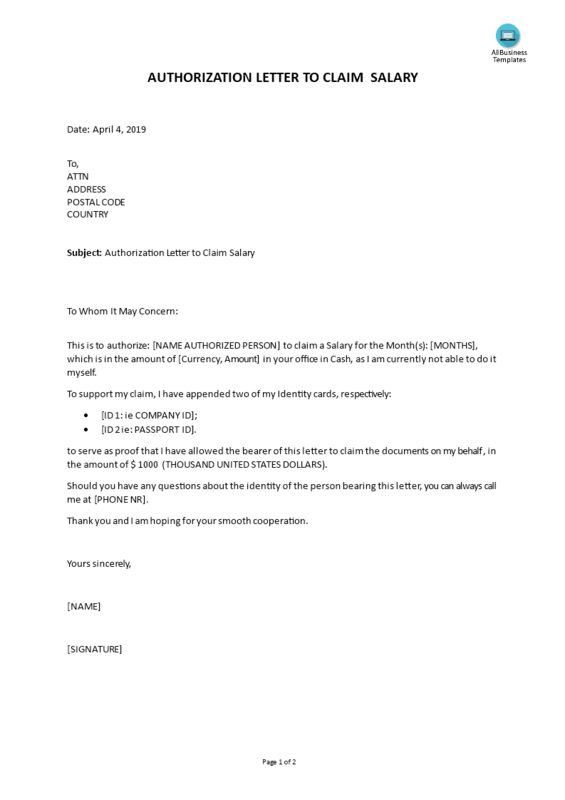 Download this sample Authorization Letter Claim Salary template now! Quickly in need of an easy-to-customize blank authorization letter template that can be used for any kind of personal privacy or business matter. Using our ready to use and easy to modify Authorization Letter for Claiming Salary gives you the right letter template in order to let someone else collect these Salary for you on your behalf. Communicating in a professional way will get you respect and will bring you further in life and business. By using an Authorization letter to claim you can help somebody to claim in a formal way a document or a right on his or her behalf. A claim may be of the several sorts depending on the item that is claimed. In general, a claim letter is made by the person who has the right to it and has a trustworthy relationship with the person that helps to collect the claim. For instance, if a person cannot go to collect his salary or passport, and the applicable Salary are ready, than you can draft a claim letter and ask a trustee to pick up the Salary on your behalf. If you are in need for such an authorization letter to make claim, and you need to provide a letter to your friend, family or colleague in order to let him or her collect your belongings at a specific place where you cannot (easily) go. Here is a useful sample letter template which will assist you in this regard. Save yourself time and efforts and download this Authorization Letter for Claim Salary now! Or check out some of our Authorization Letter to claim templates now! Check out our authorization letter sample and formats for an act on behalf, claiming, collect document, pick up & process documents and download them for free!